Signing up for this competition will yield a number of benefits to participants, including a full evaluative report (“Designer Growth Report”) received at the end of the competition, rich with feedback from fashion-loving laypersons. Winners also receive the chance to receive one of several prizes. 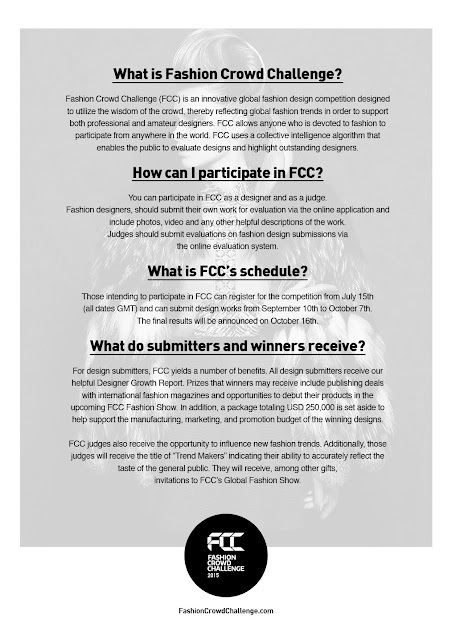 Prizes include publishing deals with international fashion magazines, and opportunities to debut their designs in the upcoming FCC Fashion Show for non-professionals. In addition, a package totaling USD 250,000 will be set aside to help support the manufacture, promotion and marketing of the winning designers.